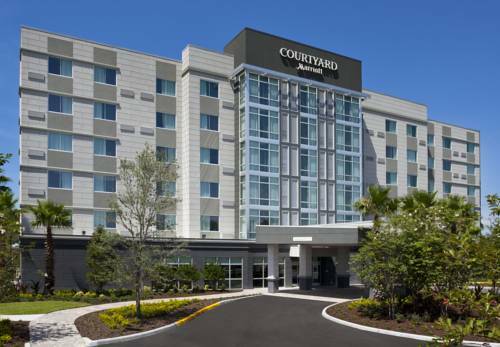 Make memories in The Sunshine State by staying at the Courtyard by Marriott Orlando South. We offer a prime location near all Central Florida has to offer like Orlandos theme parks, the Orange County Convention Center, and the Orlando International Premium Outlets. Experience Grande Lakes just across the street or travel just minutes to the Central Florida Zoo. Our hotel near the Orlando International Airport and International Drive features a lobby with inviting, flexible spaces to work or relax, free Wi-Fi throughout and easy access to the latest airport conditions, news and weather reports via a GoBoard. The highlight of our lobby experience is The Bistro - Eat. Drink. Connect., which provides guests with healthy food and beverage offerings for breakfast and dinner along with Starbucks drinks and evening cocktails. Visit The Market and pick up a snack, beverage or other sundries. A 24-hour business center and boarding pass printing service is also available.